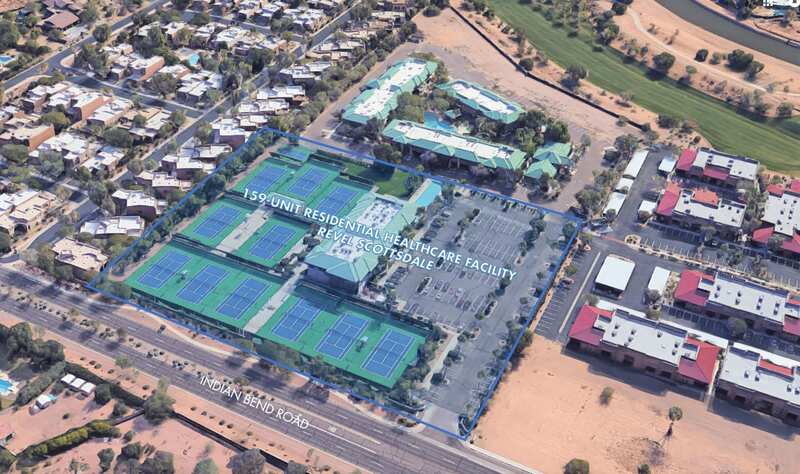 SCOTTSDALE, Arizona – The iconic Scottsdale Tennis Club, with 11 championship tennis courts and pool, will soon be redeveloped into Revel Scottsdale – a refined 159-unit senior community. The property will have 270-degree unobstructed views to the west, north, and east of Camelback, Mummy, McDowell, and the Superstition Mountains. Situated on Indian Bend Road, in between Pima and Hayden Roads, the property will benefit from its prime location. With easy access to Downtown Scottsdale and the affluent community of Paradise Valley, the area boasts luxury shopping, dining, and hotels including the future Paradise Valley Ritz Carlton. Scottsdale-based The Wolff Company, a private equity firm and developer, was the Buyer in this transaction. Resources say the company will continue to develop additional senior living apartment communities in Arizona and throughout the western United States. Scottsdale zoning attorney Barry Riddell and Technical Solutions assisted with the transaction.